to hackathons, communities are coming together to accomplish great things with gigabit speeds. Still, less than 10% of homes in the U.S. are connected to Internet served over fiber-optic networks. As more cities have access to superfast fiber networks, entrepreneurs will be better equipped to drive the next wave of innovation. That’s why today, we’re inviting Oklahoma City, OK, Jacksonville, FL and Tampa, FL, to explore bringing Google Fiber to their communities, as we did last month with three other cities. These growing tech-hubs have a strong entrepreneurial spirit and commitment to small business growth. Their list of accolades is long—from Jacksonville’s title as a top 10 city for tech jobs, to Tampa Bay’s #2 spot on the list of best cities for young entrepreneurs, to Oklahoma City’s recognition as the #1 city to launch a business. One of our goals is to make sure speed isn't an accidental ceiling for how people and businesses use the Web, and these cities are the perfect places to show what’s possible with gigabit Internet. Now we start our joint planning process, when we work side-by-side with local leaders to create detailed studies of each metro area. Constructing a brand-new fiber network is a big job—the more we learn about a city, the smoother our construction efforts will be. We’ll study factors that may impact construction, like local infrastructure and housing density. City leaders will use our checklist to share key information such as maps of water and electricity lines. Early preparations not only help with our decision-making process—they help cities lay the groundwork for any service provider to enter the market. At the end of this process, we’ll decide if we can bring Google Fiber to these areas. 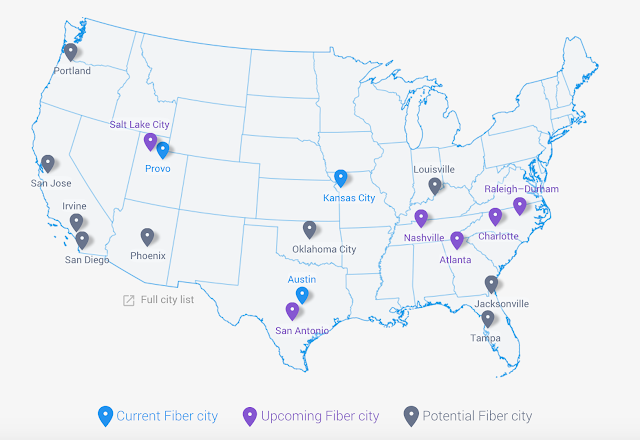 Oklahoma City, Jacksonville, and Tampa will join 15 other metro areas where we’re serving customers, designing and building networks, or exploring the possibility of Google Fiber. While timelines will vary across communities, we’ll keep residents updated along the way; go to google.com/fiber and enter your email address to receive the latest news. From startup villages to hackathons, communities are coming together to accomplish great things with gigabit speeds. Still, less than 10% of homes in the U.S. are connected to Internet served over fiber-optic networks. As more cities have access to superfast fiber networks, entrepreneurs will be better equipped to drive the next wave of innovation.